This turned out to be the best possible thing that could have happened to me. At my first table, I’d had only one or two hands worth playing, and they hadn’t panned out. In my new seat, I got good cards, I bet them, and I collected some healthy pots. I got pocket aces at least two or three times in my new position. On one occasion, after getting into a preflop betting tussle with Ellis, the player to my right, I saw a flop with two kings come out. He checked, and I made a big bet; if it wasn’t enough to put him all in, I think it would require two-thirds or more of his chips. If Ellis had a king, I would find out about it soon enough. Ellis hemmed and hawed about whether or not to call me, so I knew that he had at best some kind of draw. I was ahead, but would I stay that way? I never found out, as my rival folded to my bet. We kept on playing, and I kept on making decisions that worked out for the best. When we got down to about 20 players, my original table was broken down, meaning I got to keep my seat. When we got to 10 players, my table was broken up. I selected an open seat to the right of R—, an individual whose play style I knew fairly well. I don’t remember much else of what occurred at the final table, except that in general, it went my way. I think I got pocket aces at least once more at the table, and pocket kings came my way at least once. I also think I played the ace and king or the ace and queen of hearts and hit a flush to scoop a huge pot. I think that pot put a sizable dent in J—’s stack. I bet aggressively, in part because I was getting good cards and in part because it’s a useful tactic for big stacks. And it was working out. Eventually, we got down to two players, me and C.M. I had about three-quarters of the chips in play. 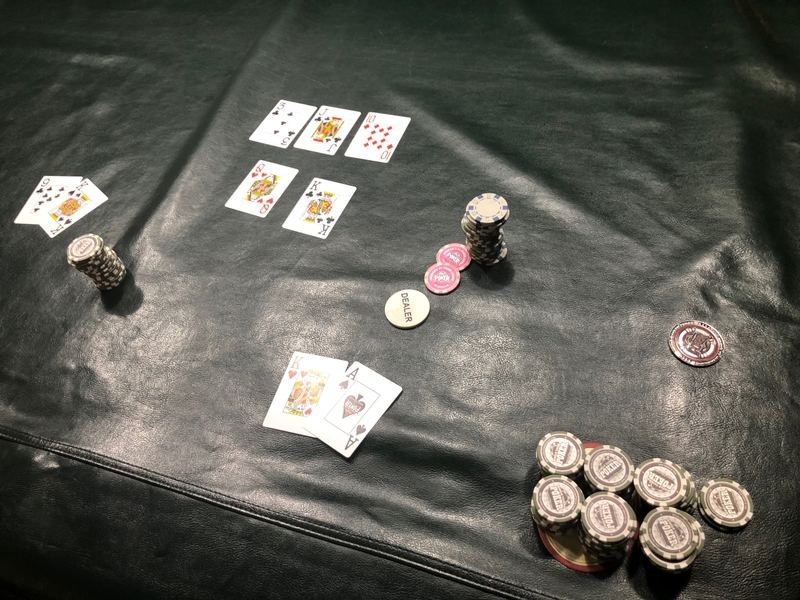 We only had a few heads-up hands — I kept on getting aces and betting heavily or going all-in. “Of course you do,” C.M. said dourly after I announced one such shove. From the button, I pushed with the ace of spades and king of hearts. C.M. pondered for at most a second before announcing his call. He tabled the king of spades and nine of clubs. The flop was dealt: The three of clubs, the jack of clubs, the 10 of diamonds. Fourth street, also known as the turn, was the queen of hearts. The river, or fifth street, was the king of clubs. I confess that I misunderstood what the board brought. I knew the queen gave C.M. a straight, 9-10-J-Q-K. What took me a moment to realize was that the lady had also given me a higher straight — in fact, the highest possible straight, Broadway, running 10-J-Q-K-A. 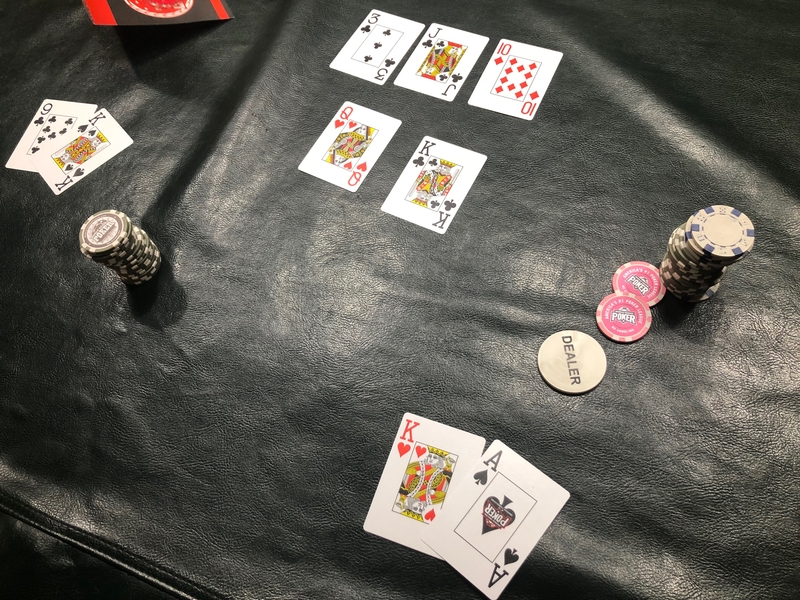 The final hand in the Buck’s Billiards Tournament of Champions on Saturday, Feb. 9, 2019, showing all chips in play. 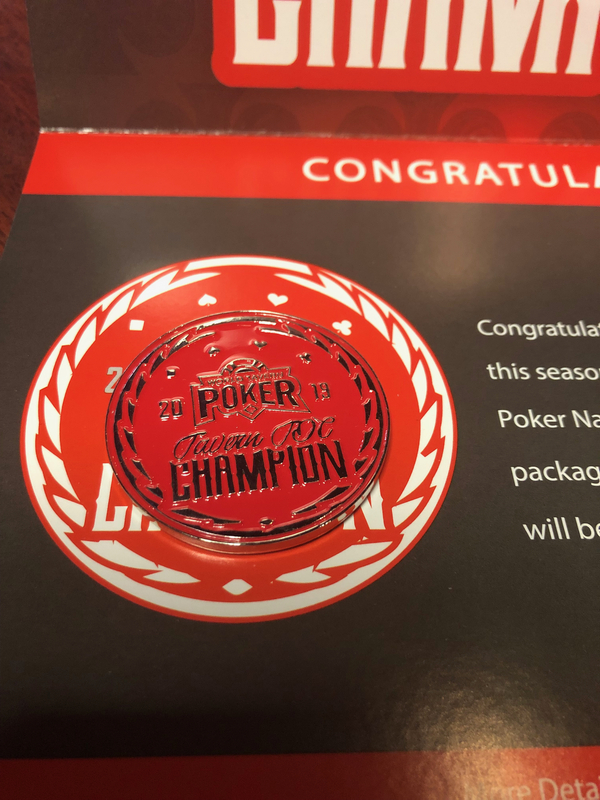 A closer look at the cards from the final hand in the Buck’s Billiards Tournament of Champions on Saturday, Feb. 9, 2019. For the first time in perhaps nine months, I collected a piece of hardware — a red medallion glued to the inside of a folder. I was so thrilled that I stopped to take a few pictures of my prize after paying my tab. 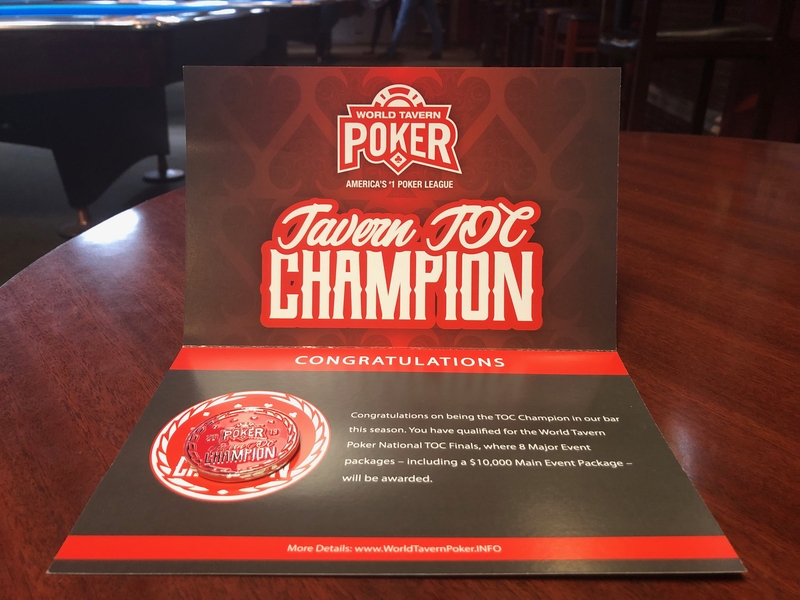 The Tavern Tournament of Champions medallion awarded at Buck’s Billiards on Saturday, Feb. 9, 2019. Unfortunately, I was so ecstatic over my victory that I forgot to claim the $20 gift card that players receive at that venue after winning a tournament. I remember moments after getting on the highway, but by then I wasn’t willing to turn back. This entry was posted on	March 6, 2019 at 9:55 am	and is filed under Diary.